NBC’s ratings are in the dumps, but over the last couple of seasons the network has figured out that it can produce live events that will play to a larger audience and bring in some sweet numbers in the ratings. Apparently, the network is now looking to produce a live version of Aaron Sorkin’s famous play A Few Good Men, which was later famously turned into a film directed by Rob Reiner. If it moves forward at NBC, the network would be looking to have Sorkin redraft the content for television. Recently, Sorkin went on the record to say he’s not particularly interested in failing at another TV series and may be done with TV for good after ending his tenure on HBO’s The Newsroom. If A Few Good Men heads to NBC, he’ll have to change his tune on the matter. While the A Few Goof Men production certainly isn’t a TV series, it will air on TV and will keep Sorkin working in the TV realm for at least a little bit longer. Not that we’re complaining. NBC’s had great success with live event programming. Of course, sports still do well on the network, and last year, NBC launched a live production of The Sound of Music starring Carrie Underwood and Stephen Moyer, which aired during the holiday season in late 2013. The Sound of Music is often shown around the holidays, and the live production did quite well in the ratings. 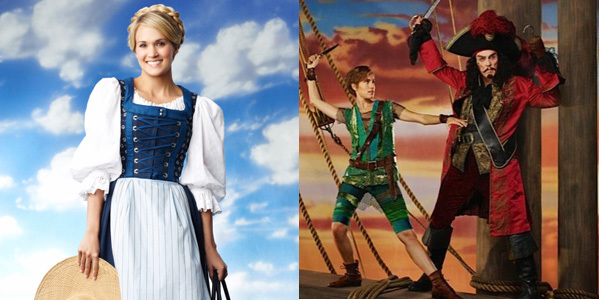 Hoping to repeat the success, this year, the network has already amped up its advertising for a second live event, Peter Pan Live!, which stars Girls’ Allison Williams as the titular character and Christopher Walken as the villainous Captain Hook. Variety doesn’t know whether or not A Few Good Men is being eyed to move forward as the big holiday production next year. Alternatively, NBC could be making these “live events” a more regular thing on the network. I’m not sure if live programming like this will continue to feel special if it pops up in the schedule more often, but I’m A Few Good Men Live! would be a feel-good hit for the holidays, either. We'll keep you updated if the project moves forward.